A single phone call to Pure Water Solutions is the first step to an integrated action plan and an affordable solution for your well water needs, small or large, for both commercial and residential applications. Pure Water Solutions, together with our team of local, properly licensed, independent contractors and sub-contractors, provides complete “one-stop” professional well water solution and services for commercial or residential water wells in Southern Oregon. Pure Water Solutions is proud to be a locally owned Southern Oregon company. We are bonded, insured and licensed contractors with the State of Oregon (CCB #:191611). We are passionate about what we do and we love purifying water! Well production can vary widely in the Rogue Valley ranging from several hundred gallons per minute (GPM) to less than 1 GPM. We recommend installing a water holding tank and storage system for wells that yield 5 gallons per minute or less. Storage tanks protect the well from potential long term damage of constant cycling, created by a potential well water demand greater than the well can produce and / or from low rainfall conditions regionally. Wells, with production less than 5 GPM, may not be able to keep up with the household’s water needs. A water holding tank system works by installing either a large 1000 to 5000 gallon poly reservoir tank or a 2000 gallon below ground concrete tank that can also serve as the foundation for a well house or storage shed, which we could also install as an additional service. 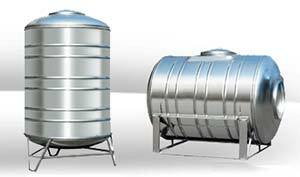 Well water storage tanks offer additional home protection in the event of a fire. We then install a special Dole valve to protect the well pump by insuring a slow fill rate based on your well’s production. A booster pump is installed to provide a pressurize water line from the holding tank to all the point-of-use faucets. As added protection we also include what is called a pump saver device to protect the booster pump and well pump in case either run out of water. In Medford and Ashland, call Pure Water Solutions for trouble free well water services and safe, dependable, purified well water for years to come.